Hello Wood Products is the Montessori world's premier provider of classroom equipment, puzzles, learning tools and furniture. We use only the highest quality materials, thicker woods, stronger hinges, more durable paints and a strict adherence to quality which ensures a superior, longer lasting product than our competitors. Our products are made to precise machinist’s tolerances. We take great care to finish all surfaces of our products, including the inside of boxes and the backs of puzzle pieces. We use safe non-toxic, water based lacquers, acrylic finishes, stains and paints. As wood is a natural product, it will have irregularities in density which will to some extent show through stain. We consider these to be 'characteristics' rather than blemishes, but please keep this in mind when ordering stained products. SPECIAL NOTE: Many school districts are requiring online registration for "preferred vendor" status before you can order from us. Please let us know if this is your situation and whom we should contact to facilitate this. When paying by check, a 5% discount is available if your check is received within 2 weeks of placing order. Check orders will not be processed until the check is received. Discount applies to products only. Please include your shipping charges. The price for shipping that is calculated when your order is placed is an estimated amount which may be greater or less than the actual amount. We cannot get an accurate price until your order is packaged, weighed, and shipped. Orders are shipped via UPS Ground. We charge you what UPS charges us plus $7 per box for packaging materials and handling for Montessori materials and $10 per box for furniture. Your credit card will be charged the exact amount when your order is shipped. If you need an exact amount for a Purchase Order or check, please call. Call for quote on all furniture. Your shipping costs will be greater the further away you are from Hello Wood Products, sometimes double if you are on the west coast. UPS ultimately determines the cost! SUMMER SHIPPING - Frequently, we have your order ready to ship during the summer months. We need to know what days and hours your school will be open after the regular school year has ended. Please include that information in the "Special Instructions" space on your order form. There MUST be someone there to receive the shipment. There will be a processing fee of $30 added to all international orders, including Canada. Please note that international shipments may have additional unknown brokerage, import, or other fees that you will be responsibile for. There is a 10-day return policy from day of delivery date. There are no returns on custom products or custom orders. If items are returned or exchanged because of customers' personal preferences, a 15% (20% on furniture) restocking fee will be applied for returned items that are not damaged, if returned within the 10-day period. The product must be in pristine condition. It may not have any dents, dings, or scratches. We do offer exchanges for items as long as the original item is still in pristine condition. Buyer is responsible for all shipping costs of the product that is being shipped back to us. Original Shipping fee is non-refundable. If an item is received damaged or is incorrectly shipped by us please contact us immediately. We strive to ship your order to you A.S.A.P. It can take three to eight weeks from the time we receive your order. During the summer, our busiest time, it can take up to twelve weeks. If you have a must have delivery deadline, be sure to communicate this to us. Please order materials well in advance of the time that you will need them in your classroom. We fill orders chronologically; orders placed in early spring insure a late summer delivery. We guarantee our products to be free from defects in materials and workmanship. If there are any problems, just notify us within 10 days of receiving your materials. To the left & below, you may browse by categories. Also, below, are listed some new and select products. This box contains three pages of 27 Amendments with tiles depicting year of Ratification, Amendment number, and paraphrase of the Amendment. Control charts included. The Bill of Rights is color coded red, white, and blue to indicate its importance. A 7” ball fits into this 14” cubed box and rolls down a ramp. Comes with ball and one ramp. If your needed item is not listed anywhere, please give us all pertinent information in the "Special Instructions" section of the Order Form. Extra ramps and connectors for the Ball Drop. Ramps may be added later as desired. The stop can be added to any ramp. The Movable Alphabet Box with a lid containing 1 each of all the capital letters! Get your lower case and capital letters all in one box with two nesting lids. 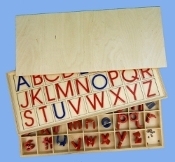 A box of tiles and board illustrating the decanomial layout. Elementary has no lines on control. 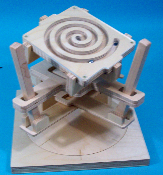 Marble Mover II lets one side of the brain move side to side while the other moves front to back. That activity can then be reversed by rotating the device. Nonsynchronized bilateral brain activity. Trays sold separately.